Cart2Cart has often been distinguished by experts for following market’s innovative pace, and growing side by side with companies that confided their operations exactly to our dynamic eCommerce solution. 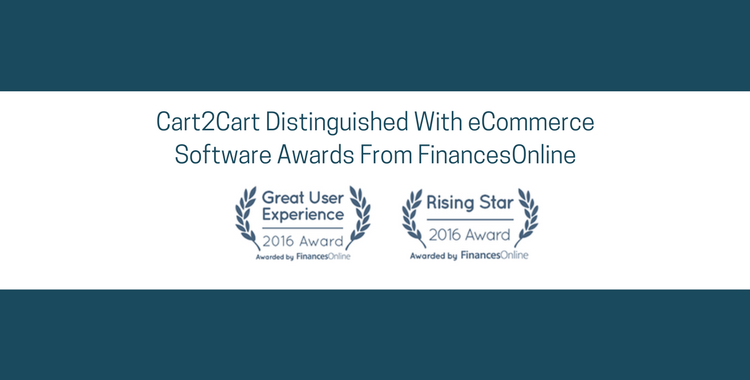 This time, Cart2Cart got praise from one of the most trusted software review platforms FinancesOnline, whose team announced a very positive opinion about our service and its features in a detailed review prepared by the platform as well as in their list of top eCommerce solutions leaders. Their B2B professionals thoroughly analyzed our product and shared their experience in a detailed Cart2Cart review here, where they also honored the system with two of their prestigious quality awards. They stated that the viable and dynamic selling and buying concept we introduced to replace single cart systems was the main reason behind distinguishing us with the Rising Star Award for 2016, while the fact that we made migration to our software painless and less time-consuming assured their experts we also deserved the 2016 Great Experience Award for the eCommerce software category. Experts are convinced that Cart2Cart contributed significantly to making the eCommerce market become a friendlier environment for small and medium businesses. According to them, our service eliminated completely the risk of losing valuable data while migrating from an old system and automated a variety of commonly triggered commerce operations to give businesses the chance to focus on things more important than importing/exporting data. In fact, they said, the whole system-to-system journey is automated, so that companies wouldn’t involve programmers in managing sensitive and confidential information. Experts also appreciated the seamless connection to more than 75 shopping cart systems, and the reliable 24/7 support we provide for all our users. FinancesOnline awards definitely motivated us to keep up the good work we’re doing, and to come up with even better features for our customers in the upcoming future.